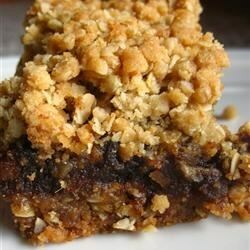 "A date filled bar with a chewy oatmeal crust. This is my grandmother's recipe which my whole family loves. You can use almond extract instead of lemon, if you wish." In a large bowl, combine oats, pastry flour, salt, 1 cup brown sugar, and baking soda. Mix in the butter until crumbly. Press half of the mixture into the bottom of a 9 inch square baking pan. In a small saucepan over medium heat, combine the dates, water, and 1/3 cup brown sugar. Bring to a boil, and cook until thickened. Stir in lemon juice, and remove from heat. Spread the filling over the base, and pat the remaining crumb mixture on top. Bake for 20 to 25 minutes in preheated oven, or until top is lightly toasted. Cool before cutting into squares. These are to die for, but omit the 1/3 c. brown sugar...dates are sugary sweet anyway; the extra sugar would be overpowering. These are addictive!